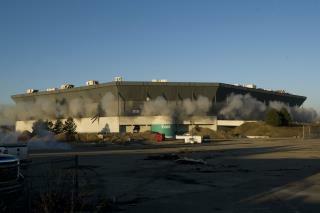 (Newser) – Talk about anticlimactic: Michigan's Silverdome was scheduled to implode on Sunday morning, and the explosives went off at 8:30am, reports CNN—but when the smoke cleared, the Pontiac landmark was still erect. The implosion did do its job of breaking the stadium's steel beams, just not enough of them. Adamo Group, which was contracted to bring the stadium down, says about 10% of the explosives didn't detonate because of a wiring issue. The beams support the upper steel band that kept the roof inflated—when there was an inflatable roof. (The Free-Press reports it was done in by a winter storm a few years ago.) The company hasn't yet identified the root cause of the wiring mishap; it's unclear whether suspected Friday-night trespassers may have pulled the wires, perhaps accidentally. Same thing happened in Minneapolis when it tried to demo the Lake St. Bridge. The bridge was so old you could see the river through the holes in the sidewalk. The bridge was so decrepit Metro Transit would not send full-size buses across it. (You had to transfer to a small shuttle bus to get across the bridge.) Then the day came to demo it and the explosions broke apart the joints, but then the joints just fell back into place and the entire bridge stayed up. Then, get this, as the new bridge was being constructed by a large construction firm (which, though, had no experience in building bridges) the workers heard a rumble from the bridge. The supervisor sent one worker out on the bridge to see what what wrong, and the bridge collapsed, killing the worker. Who needs engineered plastic explosives.. They should have used some of that MAGIC Jet Fuel that Pulverized the World Trade Centers.. The stuff that heated iron columns to molten piles, and dustified all the concrete.. so precisely that the tall buildings would fall perfectly into their own basement .. Walking back into that place involves a little risk.